These taste similar to chicken and dumplings at Cracker Barrel but better. My boys are spoiled and will not eat chicken and dumplings out anywhere. They have to be homemade like this, or they do not like them. Boil a whole chicken or chicken parts including at least some dark meat and with the skin on to get the grease needed in the water. When the chicken is done, take the chicken out and break up the meat for later. Also, take out a couple of cups of the stock with full fat and save that. At this point, you can add enough water to have a good pot of broth (about half full on a big stock pot), or you can put it in the refrigerator overnight and then skim off the fat. You can just go for the gusto and make your dumplings immediately, which is what I usually do. Take one cup of self rise flour and one cup of plain flour and then pour broth in to wet the flour. The broth has the fat, so you do not need to add any. That is all you need — just the flour and the chicken water. The trick is to get the dough to the right wetness. It is similar to pie crust. Don't put in too much liquid. Add until it all sticks together but is not runny. Get a hand full of this dough and roll out about as thick as pie crust. Then cut in pieces. You may want long skinny or short fat or square. It just depends on what you think looks nice as you cut. Drop the dumpling stripes in the near boiling chicken water. They will sink and then rise up to the top. Take a fork and push the dumplings very carefully to the side to get all the dumplings in the pot. Don't stir! You will dissolve the dumplings and have pan of dirty water and no dumplings. These are fragile. Let the dumplings simmer along for an hour or so. Take the pot and kind of rock it side to side to get the chicken water over the tops of the dumplings. But, again . . . do not ever stir. The closest you can come to stirring is to lightly mash down on the dumplings to get water up on top of the floating dumplings. 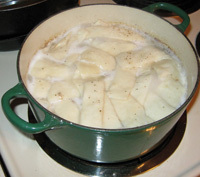 Once the dumplings are cooked, they will be very white and kind of puffy looking. You can take one out and cut it to make sure it is not doughy in the middle. This is when you put some meat in the pan. If you do it earlier, then the meat will go to the bottom and scorch on the bottom of the pan. After dumplings are cooked, they are not so fragile. They heat up great and are really better and thicker the next day. Just reheat on the stove or in the microwave. If you have quite a bit of fat from the chicken in the pot, the white sauce part may be pretty thick. You can add a little water when you heat them up.